In the wake of the Conservative Resurgence in the Southern Baptist Convention, SBC leaders and messengers agree that God is now calling us to a Great Commission Resurgence as the next key step toward genuine evangelistic renewal. Research confirms the urgent, convicting need: millions in North America still don't know Jesus, and more than 1.6 billion worldwide have likely never even heard of Him. Although the denomination's membership has increased greatly since 1950, Southern Baptists are reaching fewer persons with the Gospel today than back then, suggesting many churches are making little eternal difference. 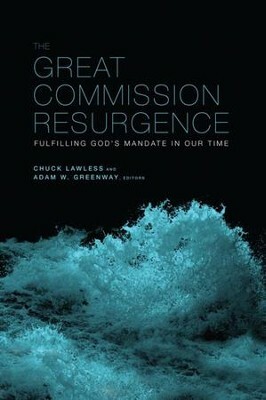 "Somehow, we have stood faithfully for a message that we have chosen to keep to ourselves," co-editor Chuck Lawless writes in his introduction to The Great Commission Resurgence. Featuring essays by Johnny M. Hunt, Ed Stetzer, Thom S. Rainer, R. Albert Mohler Jr., Jerry Rankin, Daniel L. Akin, David S. Dockery, and more than a dozen other respected SBC voices, this timely book clarifies the biblical, theological, and practical matters related to this compelling movement. It will help recapture an exciting missional vision for presenting the Gospel of Jesus Christ to every person in the world and making disciples of all the nations. "We want God to break our hearts over the lostness of the world." "Any genuine Great Commission Resurgence will occur only when God's people--His church, gathered in local congregations--admit our apathy, confess our sin, turn to Him in brokenness, preach the Word in gratitude and obedience, invest personally in the lives of new believers, and give God alone the glory." 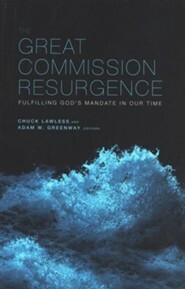 I'm the author/artist and I want to review The Great Commission Resurgence: Fulfilling God's Mandate in Our Time - eBook.